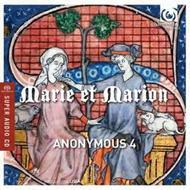 Returning to the Montpellier Codex for this programme of motets and chansons from 13th-century France, Anonymous 4 explores two dominant themes of the period: love and longing for the earthly/earthy Marion and the heavenly/virginal Marie. The Montpellier Codex, from which Anonymous 4 draw all these motets, was collected in Paris around the year 1300 and is the richest single source of 13th-century French polyphony. With a repertory spanning the entire 13th century, it contains polyphonic works in all the major forms of its era: organum, conductus, hocket and, primarily, motet (315 motets in all). Renowned for their unearthly vocal blend and virtuosic ensemble singing, Anonymous 4 combine historical scholarship with contemporary performance intuition to create their magical sound.